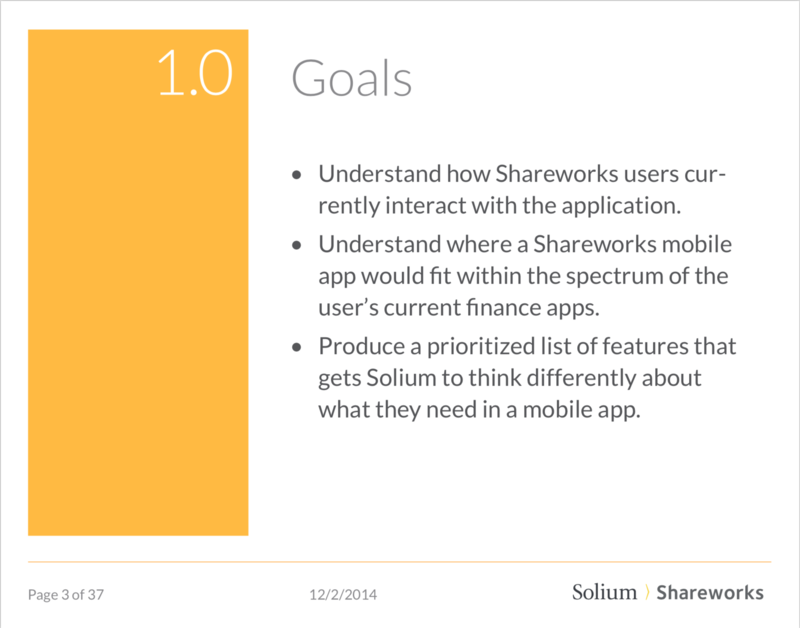 I worked with a small team of graduate students to conduct competitive analysis and create a mobile strategy for Solium Shareworks. Over the course of several weeks, I worked with a small team of fellow Bentley students to conduct competitive analysis, interview Shareworks customers, and create a strategic vision for a Shareworks mobile experience. Shareworks helps companies offer stock and equity plans to their employees. They also help plan participants manage their awards and equity stock portfolio. Shareworks had a particular mission to create a mobile experience that gave participants a sense of how much money they have, what the numbers mean, and help them figure out what to do with the information, wherever they happened to be. We started the project by doing cognitive walkthroughs of the Solium application, and meeting with the project sponsor to align on the goals of what we were doing. She was able to connect us with a handful of Shareworks customers, who gave us some perspective on what they used the application for, and their most used features. Finally, we did competitive analysis of mobile banking and trading experiences to see what best in class looked like. Laying out the goals at the beginning of the presentation helped ground our strategy with the business's needs. 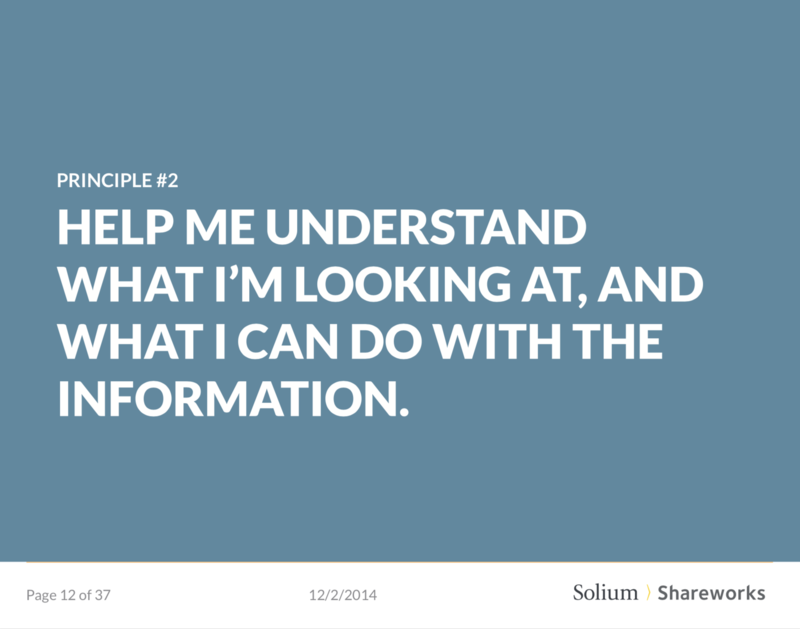 Solium came to us with a handful of existing personas. We chose to focus on a single persona, "Steve," who was an occasional invester needing to understand and interact with his annual award. 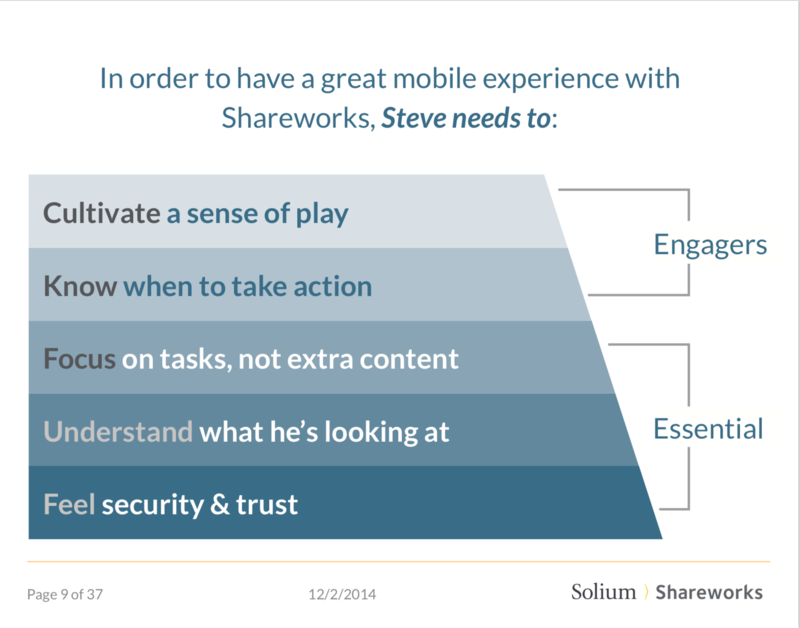 Through our analysis, we identified Steve's key goals and pain points, and mapped them to a set of design principles to guide the mobile strategy. In our report, we outlined those principles and showed examples of those principles in practice. By encapsulating the strategy in a handful of key principles, we kept our recommendations focused. Finally, we also conducted a detailed feature analysis of potential features that aligned to the principles we had laid out in the strategy. We prioritized them in a 2 * 2 matrix (Essential–Nice to Have, Utilitarian–High Polish), and detailed them in an Appendix. Prioritizing features in a 2*2 matrix helps give teams an order of operations to work against. The final vision was delivered as a presentation in class, and the detailed report was given to the project sponsor at Solium. 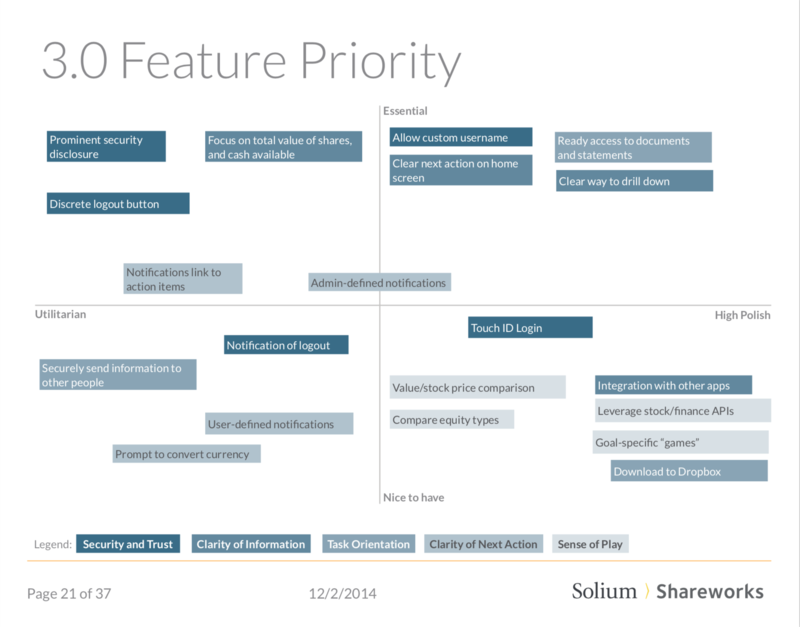 Performed data analysis, helped to brainstorm features, and assign feature priority. Wrote copy and did layout design for the final report. Gave the final class presentation, and presented the findings to the client. One word for Dani: Impressive. She's a workhorse who churns out quality with ease. She has a very strong sense of product strategy as it pertains to business needs, and a deep understanding of interaction and visual design principles.